Rep. Mary Kunesh-Podein, DFL-New Brighton, credits a politically active daughter with inspiring her to run for what would become her first House term. Kunesh-Podein became more involved politically as her eldest daughter, Elianne Farhat, worked on the 2010 gubernatorial campaign of Margaret Anderson Kelliher. “It gave me the opportunity to start getting more involved in my own community, getting to know my legislators, working with them and eventually with their support running for office,” said Kunesh-Podein, whose district includes parts of Anoka, Hennepin and Ramsey counties. 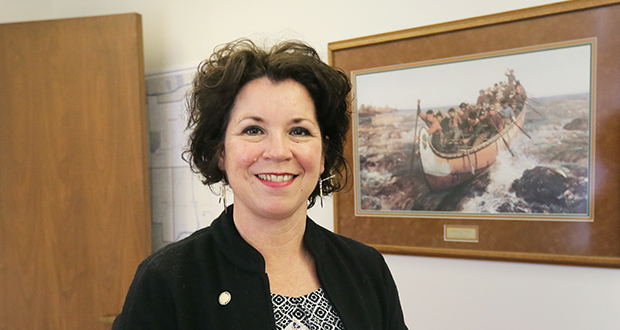 Before her House run, Kunesh-Podein served as chair of the New Brighton Parks, Recreation and Environment Commission after six years as a commissioner. Kunesh-Podein, a library media specialist with the Robbinsdale Area Schools, is on leave during session. Kunesh-Podein grew up in a family with 13 children; she was No. 9, her twin brother No. 8. With her mother and grandfather enrolled members of the Standing Rock Sioux Tribe, Kunesh-Podein also grew up aware of her American Indian heritage. A. You could ask me about my foster dogs. My husband and I do foster dog care. We have one that we adopted ourselves. In the meantime we’ve taken on another pup that’s half feral. Or talk to me about my children and my family. I have three unique and awesome children. Two of them are into politics. One is a national political organizer. My other daughter is a baker-butcher at the Lexington. My son works with Commissioner Marion Greene in Hennepin County. A. The first one I remember voting for is Jimmy Carter. I have always just adored Jimmy Carter because of his humanness. He was probably too good of a guy, too kind of a guy and too empathetic of a guy to be the president of the United States. A. I have a huge stack next to my bed and most of them are junior high-level books. I try to read as many of the current books so that I can connect that with my students as well as know what the issues are. The one book that I have been reading and been floored by is “Pushout: The Criminalization of Black Girls in Schools” by Monique Morris. Q. What’s a pet peeve of yours? A. When people don’t have the facts and they’ll just say these things. Social media, you can post and repost so many things on Twitter and Facebook. There have been times when I’ve had to say, “Have you looked this up? Have you confirmed this information?” The first thing I do is verify that information and that it’s a primary source. I teach this to my students not to believe everything on the internet and not to put into your papers or research anything but the facts. Q. How has an event or person inspired you? A. My eldest daughter, Elianne Farhat. This young woman has got such a core of dedication and determination for human rights. She showed that at a very young age, standing up for others that couldn’t. … She’s grown up to become a national organizer around fair wages and safe workplaces. If I as her mother can live up to that, I feel good. Q. What’s a way to end partisan polarization? A. I wish we could get past campaigning and politics and look at what we need to get done for Minnesota. If we could get past the nasty campaigning, the incredible fund-raising that has to go into campaigning, the television commercials and publications that try to destroy people, I wish we could just get away from that. Because the bottom line is we want what’s best for Minnesota.